Congratulations to Judy Dunlop on receiving the 2017 Ewart-Daveluy Indexing Award! 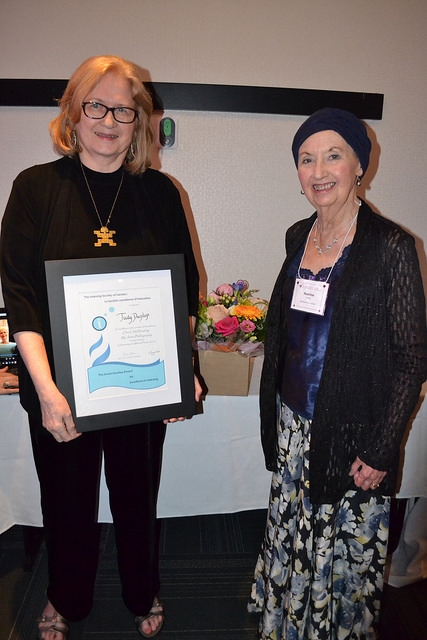 Judy Dunlop was presented with the Ewart-Daveluy Award for Excellence in Indexing at the awards banquet of the Indexing Society of Canada in Montréal on 2 June 2017. The award honours Judy’s indexing of One Child Reading: My Auto-Bibliography by Margaret Mackey, published by the University of Alberta Press. One Child Reading is a unique and fascinating examination of reading and literacy development. Author Margaret Mackey revisits the things she read, viewed, listened to and wrote as she grew up in the 1950s and 1960s in Newfoundland. Her reading included school texts, knitting patterns, musical scores, games, church bulletins, family magazines and hundreds of books. In One Child Reading, Mackey weaves her growing literacy and social consciousness with the books of her childhood and youth and the history of the time and place. An excerpt of the index is available here, with permission courtesy of the University of Alberta Press.